Nettles are found all over the world and are especially common on damp and nutrient-rich soil. It is one of the plants highest in proteins and helps all protein pathways in the body – digestion, immune response, liver metabolism, skin reactions and kidney elimination. Nettles are rich in chlorophyll, iron, calcium, potassium, silicon, magnesium, manganese, zinc, chromium and vitamins A, C, K and is an excellent nutritive tonic. Nettle has many uses and helps alleviate chronic skin conditions (like eczema, hives or acne) and alleviates the symptoms of PMS and menopause. It is useful for the genitourinary system, strengthening weak kidneys and helpful for liver issues. Frequent use of the infusion helps to stabilize blood sugar, reduce fatigue and exhaustion, eliminate chronic headaches and restore adrenal potency to lessen allergic and menopausal problems. Stinging nettle has hairs that are actually phytohypodermic needles that inject irritating formic acid into the skin on contact. The hairs are disarmed by a quick steam or blanch in water. Nettle can be prepared as food or medicine by cooking, drying or tincturing. 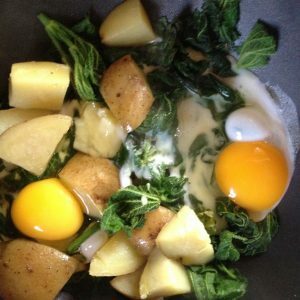 Nettles can be made into a spring greens soup, cooked like spinach or blended into a pesto. We at Sawmill like using dried nettles all season long for teas and infusions. Nettles is like land seaweed, deeply nutritive and mineral rich. Use fresh in cooking (cooking deactivates the stingers) or dry to as a spice on salads, potatoes or in soups. The fresh and dry herb make a nourishing tea, especially if the dry leaf is infused for 6-8 hours or more making the water almost black. As a mineral rich plant nettles makes an excellent vinegar, as vinegar is ideal for extracting minerals. Fresh nettles is also well preserved as a tincture and taken as a daily tonic. Pour boiling water over 1/2 oz dried nettle (leaf, stalk and/or seed) in jar, cover tightly and let sit overnight. Next morning, strain into a jar and add 1 tablespoon of nettle tincture (optional). Keeps only a day or two. Use as a final rinse after shampoo and conditioner, leaving it in the hair. Helps to thicken hair texture, promote healthy, shiny hair and eliminate dandruff. 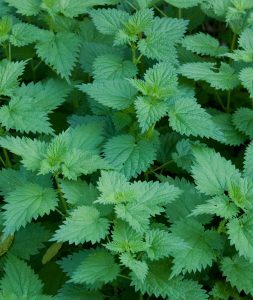 Cautions/Contraindications: Nettles is safe to use as medicine but take caution when picking the fresh plant as its little hairs will sting and may leave mosquito like bites. These will go away after a few hours or a few days. Sensitivities differ, in fact some embrace the stings as a therapy. Using gloves will minimize if not eliminate contact with the stinging hairs.